Brittany's mom was able to come and visit for a whole week. We loved the help that was provided. 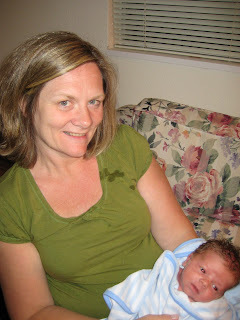 Gammy did all the cooking, cleaning and getting up in the middle of the night with Cade. It was wonderful! When he was ready to eat she would bring Cade to Brittany and go back to bed, the night would continue this way. She helped Brittany put Cade on a sleeping schedule, thanks! Around 2:00, 5:00, 7:00. Gammy was so excited to see Cade for the first time. She made us all go to the airport at 9:30 p.m. to pick her up. 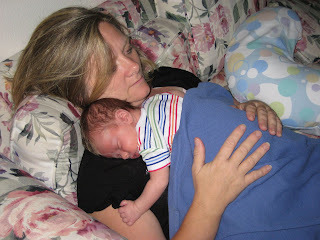 When we got home she gave him a sponge bath and helped put him to bed. 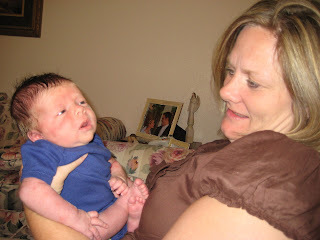 Cade just loved being with his gammy, whenever she talked to him he would stare into her eyes. It was so cute! 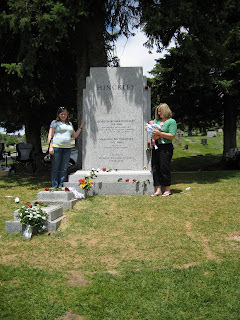 Gammy wanted to go visit President Hinckley's grave while she was in town. Robby and Dallas came to visit that weekend while Gammy was in town. 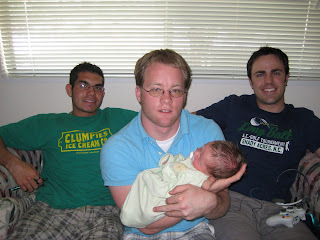 They were so good with baby Cade. They wanted to take a picture of just the guys. Brittany's family. 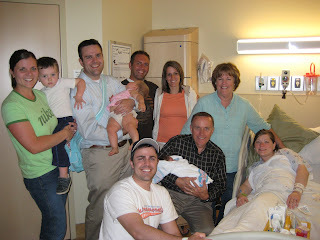 It was so wonderful having some of Brittany's family come visit and see the baby for the 1st time! It was especially wonderful having Gammy stay for a whole week. We offered to hire her, but she said her family in TN needs her more. Personally we think there just wasn't enough excitement and noise in our apartment. Caden Vincent's Arrival 6/9/08 3:25 p.m.
Brittany started feeling back contractions around 11:00 p.m. Sunday night 6/8/08. She didn't think a lot about the pain until she turned to go to sleep around 11:45 and the pain continued. She started counting down for an hour and was having contractions every 5 minutes. 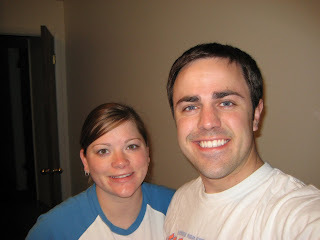 Cameron and Brittany decided they should get their last minute packing ready and leave for the hospital. (Above is a picture of Cameron and Brittany about to leave.) They were on their way around 1:00 a.m. and arrived at the hospital at 1:30. 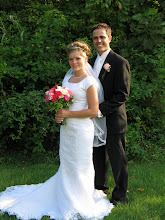 Brittany was dialated to a 2 on arrival and because of her pain the doctor decided to have her stay. 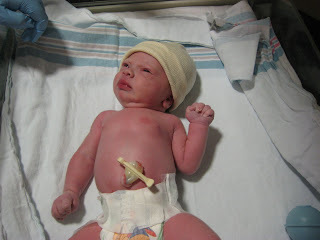 Around 7:00 she was finally given an epidural and soon after the doctor came in and broke her water. 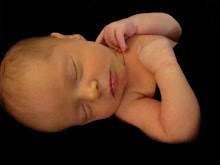 She continued to progress slowly until around 12:40 (which was supposed to be her 39 week check-up with the doctor) she was fully dialated. 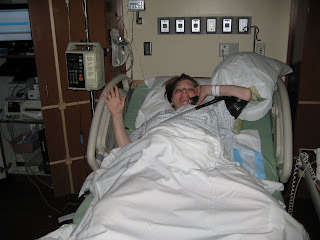 The doctor came in and told her to let contractions push the baby down for an hour. The nurse came in after an hour and had Brittany push for another hour. The doctor was called back in around 3:00 and Caden decided to join us at 3:25 p.m. (Exactly a week early) After getting color back into his skin and being cleaned off Cameron and Brittany found out that they had given birth to a very handsome baby boy, 7 lbs. 1 oz, 20 inches. They are both very excited to have Caden Vincent Long join their family! Brittany was on the phone with her mom and sister, Bonny, the whole time keeping them updated on all the adventures of her labor. 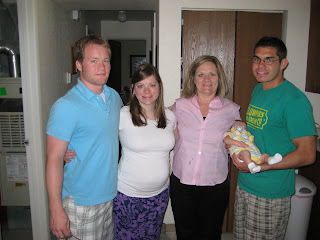 Neither one of them got any sleep that night because of the excitement of Caden's arrival. 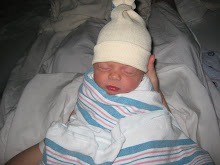 Caden, soon after his arrival, wondering what in the world is going on, "Where am I?" 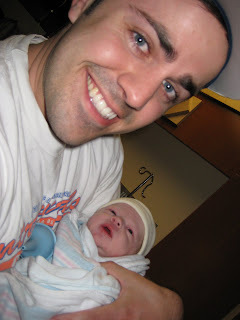 The proud daddy holding Caden while mommy was being cleaned up. 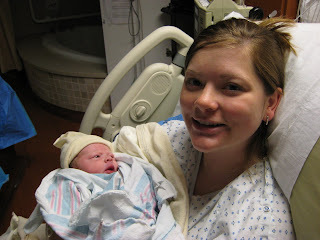 Brittany finally getting to hold her new baby for the 1st time around 3:45 p.m. A very excited mommy! 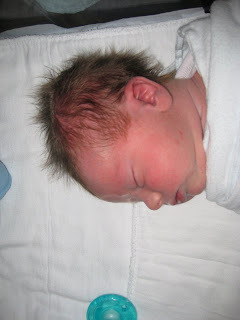 Look at all that hair!!! I love it, I just hope it doesn't fall out or go lighter. Here's all our family and friends that came to visit. Lisa(Sister-in-law), Mason, Dave (Cam's brother) Ellie, Joe and Lindsey (our friends), Nancy and Steve (Cameron's Parents), Cade, Cameron, and Brittany. 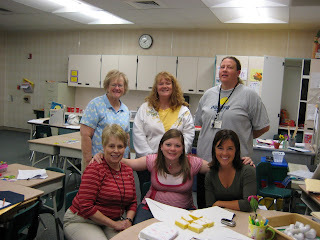 Friday, June 6th was my last day of teaching. Yay! Cameron came to help me pack up my classroom after school was over that day. We were there until 7:30 p.m. getting everything packed and out of my class! Thanks so much Cameron, I love you! Now I can just relax and wait for the baby to come. 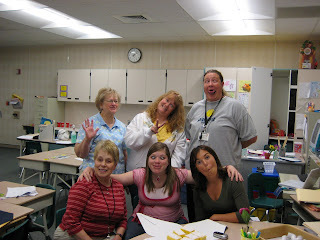 Here are a few pictures of my '07-'08 2nd grade class and my wonderful team I had the opportunity to work with all school year. 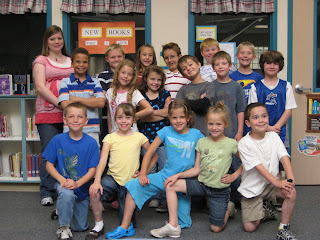 My cute students...Front left to right: Alex, Jayci, Madeline, Tessa, Deylon. Middle left to right: Stoney, Faith, Mercedes, Ben, Brad, Kharren. Back row left to right: Me, Landon, Alyssa, Alec, Troy, Drew. 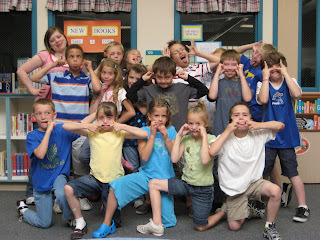 My students, of course, wanted a goofy picture too. My team! Front: Linda, Me, Katie. Back: Gladys, Coral, Kaisa. My team, of course, had to have a goofy pose as well...haha. J/k as you can see a couple of the teachers did not.